Included in the new devices introduced today by Microsoft, was the new Microsoft Surface Pen. 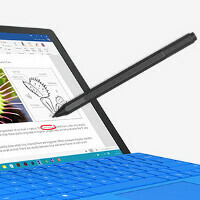 Microsoft says using the writing instrument is just like using a non-digital pen/pencil on paper, with a writing tip on one end, and an eraser on the top. The Pen comes with a Pen Tip Kit that allows you to select the tip that feels the best while handling different tasks. The Surface Pen uses a AAAA battery that lasts for up to 18 months, and works with the Microsoft Surface Pro 3, Surface Pro 4, Surface 3 and the new Microsoft Surface Book. You can now pre-order the Pen together with the Pen Tip Kit, online from the Microsoft Store. The price is $59.99, and it will ship on October 26th. You can get directly to the pre-order page by clicking on the sourcelink. The Pen Tip Kit, which is included with the purchase, is a $10 value according to Microsoft. The tip that comes installed on the new Surface Pen (HB) handles writing and sketching. The "B" tip is used for illustrations and the "H" tip is for drawing. "2H" is used for drafting. The pen is available in charcoal, blue, red, silver and gold, and has 1024 levels of pressure sensitivity. In other words, the lines you draw on the screen can be thick or thin, or something in between, based on how hard you press on the Pen while using it. That Apple Pencil looks less and less enticing when compared to the competition now, doesn't it? I mean its even made of plastic. Who makes a $100 plastic pencil? I was going to say Wacom styli are plastic too but even they aren't that expensive. You can't even fool yourself. Except that a monkey wouldn't know better. I am very certain that this person is intentionally trying to fool us into believing he is as ignorant as he makes himself out to be. I'm not buying it. iMichael your IQ just dropped from 10 to 1!